Women's Balmoral Side Adjustable 3mm Neoprene Rain Boots is rated 4.1 out of 5 by 18. Cuidado: utilice los limpiadores Hunter Boot Shine y Rubber Boot Buffer para mantener sus botas en las mejores condiciones. Se debe tener cuidado con las botas con caña de tela. Para limpiar la tela, deje que se seque sola y frótela con un paño de un color neutro. Rated 1 out of 5 by velvetsnout from Beautiful and comfortable, NOT very durable. Just 3-4 months after i bought these beautiful, comfortable boots, the soles started to delaminate and separate from the boots. Very unfortunate. If only they would improve durability, i would buy another pair. Rated 5 out of 5 by efraser3 from A last minute purchase I am happy I made! After spending lots of time hiking in Hunter's Original Tall Rain Boots, I wanted to look for a boot that was more durable. So, I ordered these from the Field collection. My toes, along with toe warmers, were nice and toasty in these insulated boots, even when standing for hours in icy tundra water, along with up to three layers of Smartwool socks (their mountaineering style is warmest). My favorite part, though, was how comfortable it was for me to hike in these. I hiked through snow and watery tundra all day, and these certainly held up. Best yet, they're super easy to clean! All I had to do was wipe a wet paper towel over the mud that got on them. It was nice to travel back with clean boots. Rated 4 out of 5 by Fleatty from Very well made and sturdy I bought these for a more durable, comfortable rain/mud boot for hikes on rough terrain. I wear a 10.5 and the 11s were perfect with room for thick socks. I loved the dark olive. The boot is a little heavy, rugged, and sturdy. Although I liked them, I decided to return them. For the price I didn’t think I would wear them enough to justify. Other hunter field and original boots I bought in an 11 were too large and roomy. The refined and the balmoral seem to fit me better. Rated 5 out of 5 by Jeepdriver from Beautiful,... This boot is beautiful, excellent construction and quality from the top to the tip: too much boot for my purpose, however. It is very thick and slightly heavy- perfect for someone who needs to be protected from the elements and needs traction outside all day, and can change their to driving footwear at the end of the day.... additionally, the money I spent did not get refunded in a timely manner. It is Wednesday and UPS shows delivery confirmation to Hunter last Thursday- still waiting for my $265. The boots were sent back exactly as I received them- plastic boot covers and all. Rated 5 out of 5 by Dallas from The Most Capable Comfy Boots I've Bought Yet! My feet are securely tucked into to these amazingly tough yet gorgeous looking boots. These boots are extremely capable of doing any kind of work I subject them to and come out looking great at the end of the day. Best boot buy I've ever made by far! I Love Hunter Brand So Much. I already had a hunter soft rain coat that the color is a perfect match to my Balmorals. Whenever I want to dress up my look I just add the jacket for a stylish match. Rated 5 out of 5 by Pete from Far Superior Boot I purchased these boots for my wife about a month ago and she loves them. She's a 7.5US, I purchased the 8 which fits her perfect with the Hunter boot socks. The aggressive sole and insulation on these boots makes it perfect for trekking in ice and snow but even better for the day trips to our property and ridding 4 wheelers. Fantastic Boot, she keeps saying how comfortable they are. 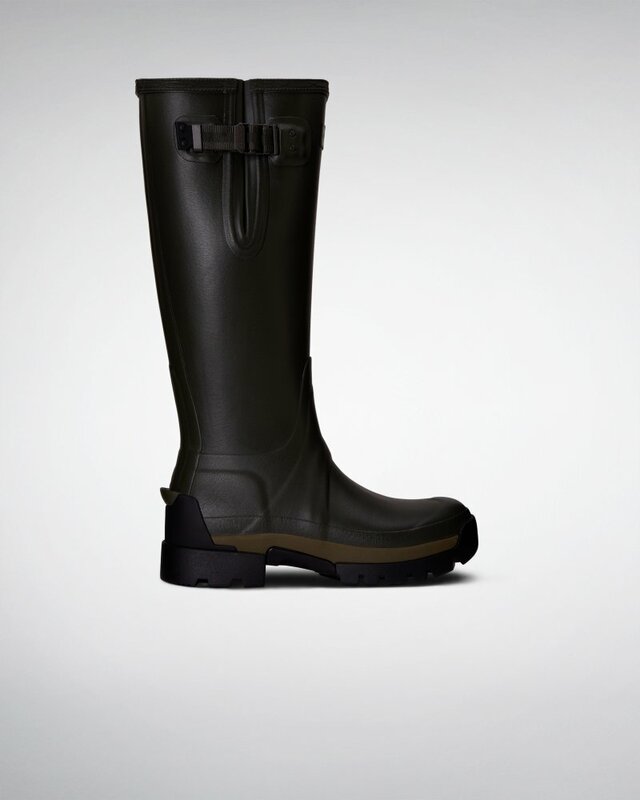 Thank you for offering a more robust option to your classic rain boot. Rated 5 out of 5 by KelKel from Love these! I was pleasantly surprised that these tall boots are very easy to slip into in a hurry and they are comfortable and warm! My only two wishes: That Hunter would make them in black and also a "shorter" version ~ I would definitely buy them!!! Rated 5 out of 5 by MaransLife from Gorgeous and heavy duty This boot looks gorgeous and is more rugged and sturdier than the regular tall rain boots. Love the fact that it comes with 2 different gel inserts/different thickness. The only thing is I have a little bit of difficulty getting into the boot with my right foot, seems my foot is higher at top, but once it’s in, it’s comfortable.